Rainbow's quirky newsroom-style take downs of politicians and talking heads of the 24-hour news cycle have made him an internet star. Do we know why the president is in attack Mo sweetie,I'll take from it here. ??? You can't stop arrogance ??? Reporter: H a social media sensation. Among these ??? Reporter: Cashing in on Libera rn therump era. ?? ?Ever has there been a stable GE as smart as he ??? Repte Randy rainbas ckiral gold with quirky, newsroom-style takedowns of T current administration. WHA exactly does educatiosecretary do? I don't know. R: And the tal heads of the EWS cycle. The problem with the presidentnited states and the cndse express that opinion is exactly what -- 'M sorry,'m going to stop you. The corwhat? The commander of chase. Reporter: The style has becois trademark. Campy for Su it melds musical theater and political humor. Noon and I mean no one, is from the rainbow treatm from "Beauty and the beast" -- ??? leave your kid in the car received a pg rating ??? ??? in this case pgta "Pretty gay ??? T babs. L donergain -- We never ate dinner. Reporter: He W out tho pink glasses. They caught on Yo in my liveeople show up in the audience wearing th E kd of taken on a theirown. Reporter: Whatever he's doin he's shining Amores of iernetars. Th remix has been seen o1.million tis. Esperate ceto ??? ??? upsetting everyonou meet-o ??? Reporter: Aself-taught theater kid making movief a spare bedroom in his apartment in astoria, queens. Hat's me actin wh that wall right there. Metimes I'll put up tape te the es Reporter: A band. Aside frommushy, his cat. Are you ay? I know this is a lot of nation. Reporr: He doe it all. Writing, shoot produng videos. Sometimes in a matter of hours. It's my executive producer. Repor it all starts wi dialing in on the news of the day. I basically go through the inteiew a kd of timetamp everazy thinghat I kin of want to remark on. Ich is why I have carpal tunnel. This is the prop and cme closet. This is where I keep myy slippers and my make America great again M people do. Reporter: Modest digs for meone with his reach and level of fame. This where the magic happens. Reporter: A journey that comes with a cha suring moments. I got an e-mailoman claiming she was Hillary cls dor. D T can I do for you should she idase make a happy birthday video for Hillary. I sent herideohinking it uld just LE on this crazy woman's phone. Then week later this came in themail. This big, fancy envelope. It was from Hillary Clinton. The rum are true, I a fan of your work and I'm gra to you for lending your tal and crvipretty craz all from my living room ??? wet trouble ??? Rter: Despi his liberal slant,nbow insists he has fans as tol spectrum. I hear from peoplell the time, from all sides of the aisle D I hear from people, Ely enough, who say, I don't agree with U politically, but I love your videos, the made me laugh. You've had a rough for about a year now -- Reporter: Making comedy out of contrsy has bee a winning formula fornbow nc his first viral hit back in 20. Hey, baby. How dare you act like such a [ bleep Ang on sec, okay? I' have romantic conrsations with horrible racist, misogynist, itic rts and that became a es. Yant to come here first? Hey're too big look upid. They're just pillows. Ip hear bleeping sound every time youay the "N" word. Peopleesponding to something so negative and horrific,I P that funny spin on I -- I don't love you! Sweet dreams . Do you feel like T's an attack I the moment that we're in right now on Freeh? Comedy I think is kin of endangered art formightnow. People think areore stei offended. To go after comedians to me I counterproductive. I see in the press a lot, almost like celties or people, they thinhey're celebrities -- Why didou lk at me when you said that? I'm from the school THA really nothing is off lims far ascomedy goes. ??? And he fires whole staff on social mediar: Despite a tough mate for cedy these days, Randy has an optimistige for youngsters. It's ING time when get where they're going without the middlema so go for it. Reporter: For "Nightlin" I'chary Kies in New York. 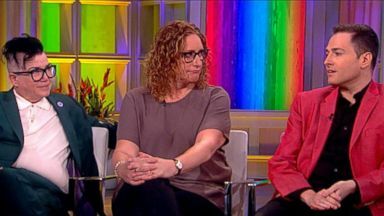 Lea DeLaria, Judy Gold, and Randy Rainbow sat down with "The View's" Joy Behar as a part of ABC News' #PrideMonth speaker series. 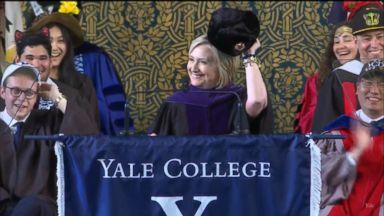 Former Democratic presidential nominee Hillary Clinton returned to Yale University's College Class Day prepared with a Russian Ushanka hat.